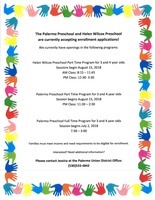 Please see the attached flyer regarding preschool enrollment. All Palermo Schools will be closing today, February 14, 2019 due to localized flooding. Schools will resume on Monday, February 25, 2019.